JACOBI, M. 2018. The Toothed Scorpions of the United States. Journal of the British Tarantula Society 33(3): 9-18. ABSTRACT - Photographs and descriptions of the five species of Diplocentrus scorpions that occur in the United States along the Mexico border from Texas to Arizona. JACOBI, M. 2018. American Mountain Endemics. Journal of the British Tarantula Society 33(2): 10-16. ABSTRACT - A field report covering two Sky Islands species of tarantula: Aphonopelma chiricahua and A. peloncillo. The former inhabits the Chiricahua Mountains of extreme southeastern Arizona, while the latter is found in Peloncillo Mountains in southwestern New Mexico. JACOBI, M. 2017. Pictorial Field Notes on some Tarantulas, Scorpions & other Arachnids of the American Southwest. Journal of the British Tarantula Society 32(2): 24-45. ABSTRACT - An overview of some of the arachnids encountered from Texas to Arizona in the spring and summer of 2017. JACOBI, M.A. 2016. On the two forms of Poecilotheria (Araneae: Theraphosidae: Selenocosmiinae) considered P. subfusca in arachnoculture and their proper nomenclature with a taxonomic overview and distribution map of tiger spider species in Sri Lanka. 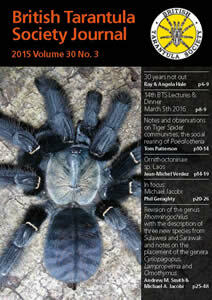 Journal of the British Tarantula Society 31(3): 22-37. ABSTRACT - The Poecilotheria tiger spider from the Central Highlands of Sri Lanka currently regarded as P. subfusca is argued to be two distinct species from two isolated and completely different habitats. My article discusses the warm highland forests (ca. 600m elevation) surrounding Kandy, and how the type specimens of P. subfusca are from that region, and contrasts that to the cool alpine forests near Nuwara Eliya (ca. 2000m elevation) where a smaller, much darker form lives. The former is often referred to in arachnoculture as P. sp. "lowland" and thought of as the "new species", but this is the spider described by Pocock, 1895 as P. subfusca . It is the 'P. sp. "highland"' that is deserving of description as a new species. SMITH, A.M. & JACOBI, M.A. 2015. Revision of the genus Phormingochilus (Araneae, Theraphosidae, Ornithoctoninae) with the description of three new species from Sulawesi and Sarawak and notes on the placement of the genera Cyriopagopus, Lampropelma and Omothymus. Journal of the British Tarantula Society 30(3): 25-48. ABSTRACT - This project began as the description of a new species of Phormingochilus from the Kelabit highlands of extreme northeastern Sarawak (Borneo). This spider is P. pennellhewletti, honoring collectors Mark Pennell & Dean Hewlett, and was dedicated to their dear friend and guide Jaman. But publishing this new species required comparing type material and revising related genera whilst describing a total of three new species of Phormingochilus. One of these was P. carpenteri, which is the hobby's "Cyriopagopus sp. Sulawesi black". Perhaps the biggest and most controversial change this paper made was revising the southeast Asian earth tigers of the genus Haplopelma using the senior synonym Cyriopagopus. JACOBI, M.A. 2015a. Notes on the first American breeding of Pachistopelma rufonigrum with an overview of the genus. Journal of the British Tarantula Society, 30(2): 15-25. JACOBI, M.A. 2015b. Monocentropus lambertoni – A brief overview with comments on habitat and questions of the validity of our hobby identification. Journal of the British Tarantula Society, 30(2): 26-33. JACOBI, M. & PATTERSON, T. 2016. Huntsman spiders of the genus Heteropoda (Sparassidae) in captivity. Journal of the British Tarantula Society, 31(1): 24-33. JACOBI, M.A. 2011. Tarantulas (Animal Planet Pet Care Library). T.F.H. Publications, New Jersey. KORINEK, W., EFFENHEIM, B. & JACOBI, M.A. 2005. The US Breedings of Poecilotheria subfusca Pocock, 1895 with Notes on Pre-breeding and Post-breeding Conditioning.. ARACHNOCULTURE, 2(1): 24-37. JACOBI, M. 2005c. Beyond the cricket: Alternative food for captive arachnids. ARACHNOCULTURE, 1(3): 167-172. JACOBI, M. 2005b. The basics of arboreal tarantula husbandry. ARACHNOCULTURE, 1(2): 68-80. JACOBI, M. 2005a. Experimental housing for montane "tiger spiders": Poecilotheria smithi and P. subfusca: a preliminary report with comments on P. rufilata. ARACHNOCULTURE, 1(1): 30-41.